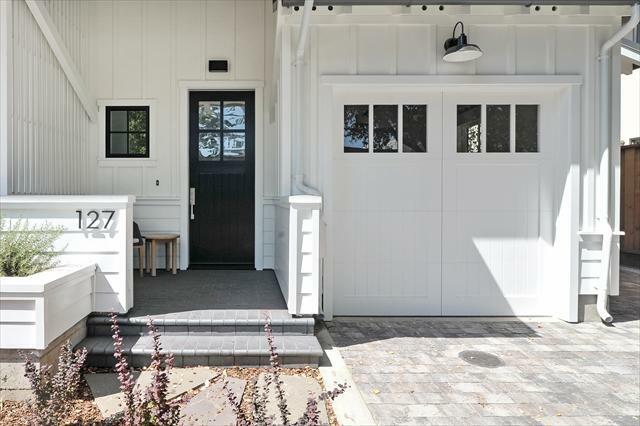 A brand new Modern Farmhouse awaits, offering the ultimate in luxury living only blocks from vibrant University Avenue in downtown Palo Alto. The design by acclaimed local architect, FGY, is both captivating and timeless. 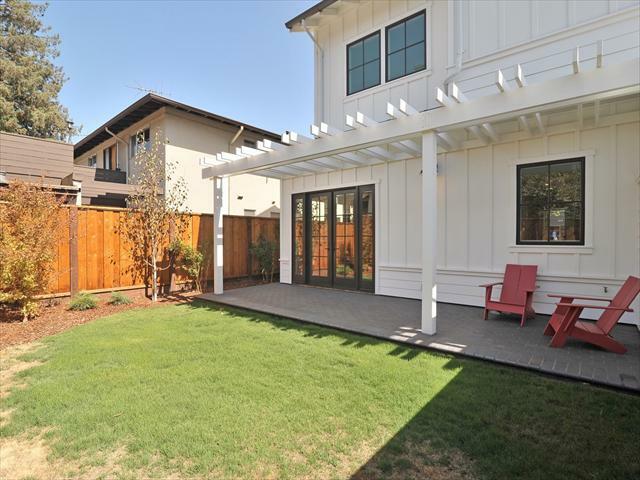 The attached single-family home features innovative green and smart home design with impeccable finishes and detailing. 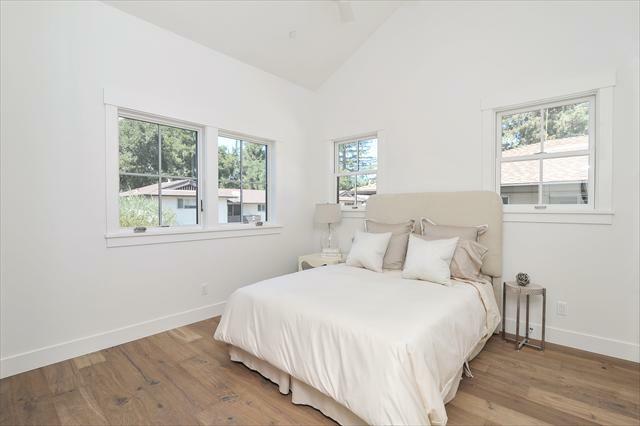 Amenities include wide plank white oak floors, 10+ft ceilings with custom-milled beadboard, custom 8ft doors and barn door, and high-end Andersen windows and skylight. 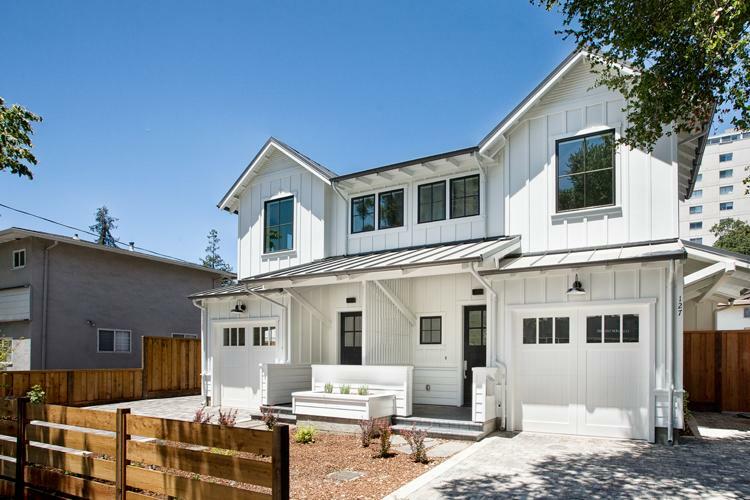 The two-story home features three bedrooms and two bathrooms on the top floor, plus a main-level powder room. The dramatic open kitchen features SubZero and Wolf appliances for refined gourmet dining. 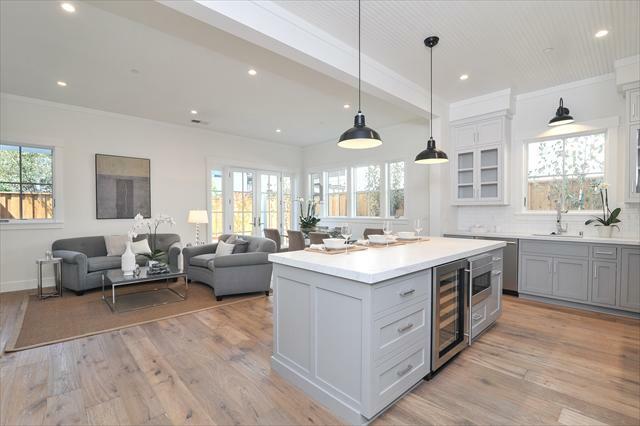 The open concept living/dining room is ideal for entertaining and connects seamlessly to the private backyard through gracious French Doors. 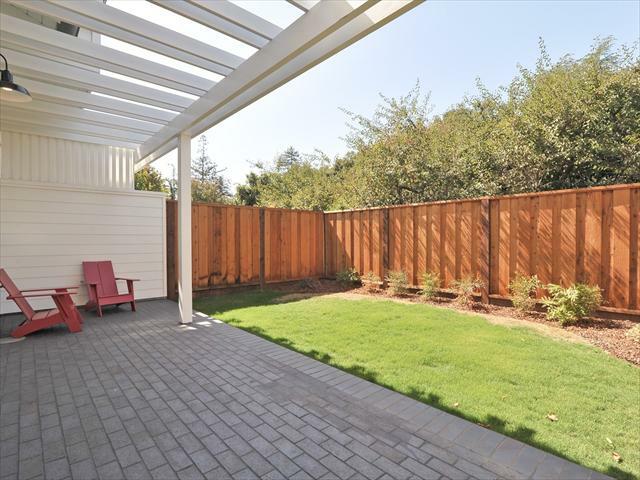 The private yard features a pergola-covered outdoor dining area and lounge illuminated by custom barn lights, lush sustainable landscaping, and Connecticut Bluestone pavers. 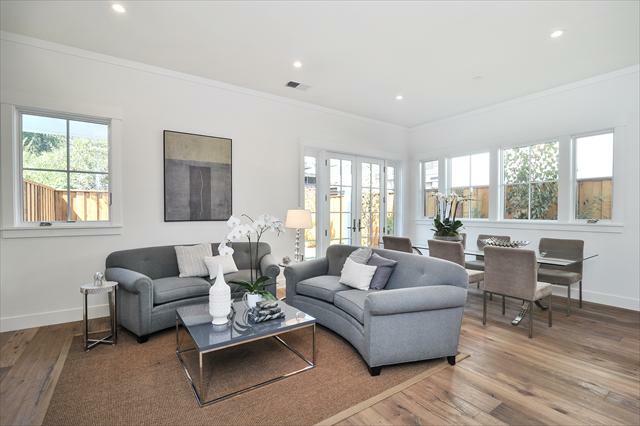 The coveted Downtown Palo Alto location is only blocks from University Avenue restaurants and shops, community parks, Stanford University and Shopping Center, and the Palo Alto Caltrain station. 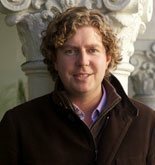 Award-winning Palo Alto schools. 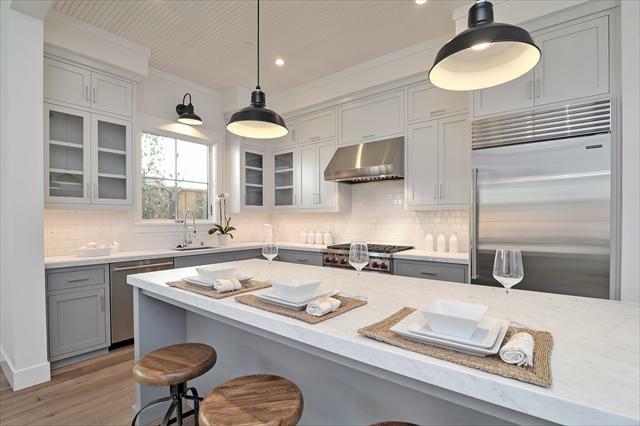 • Kitchen featuring Carrara marble counters with subway tile backsplash and a large Carrara marble center island with space for countertop dining. 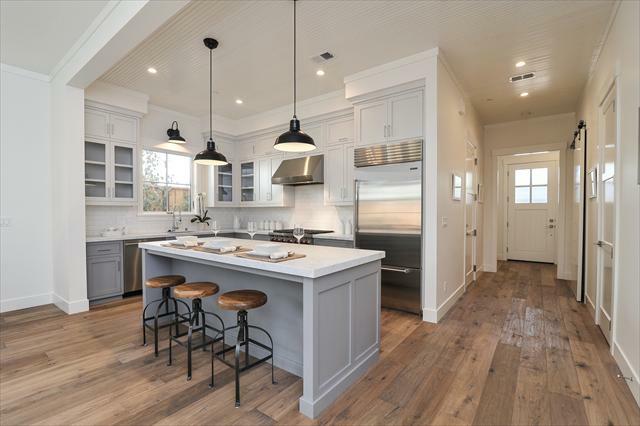 Amenities include a Wolf six-burner 36” range with hood, SubZero 36” refrigerator, wine refrigerator, microwave drawer, Blanco sink and faucet, soft-close drawers, custom Shaker cabinets, and custom lighting fixtures. 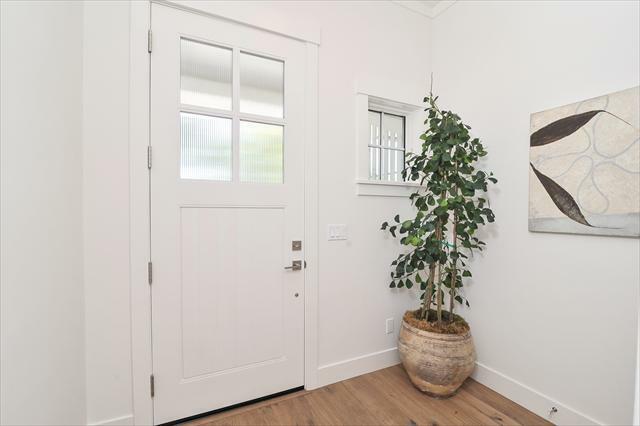 • Striking tall front door with glass panes opening upon the front entryway. 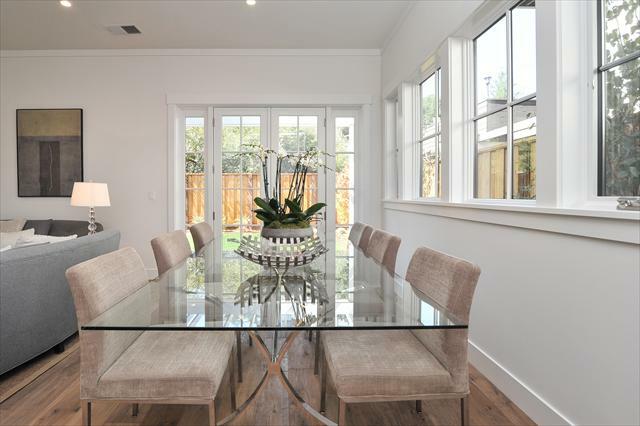 • Open dining and living room with French doors opening to the private backyard. 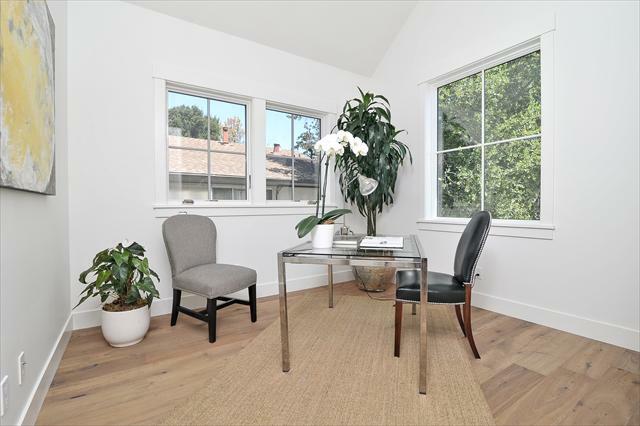 • Private master suite with entryway, two closets, peaked ceiling, and ceiling fan. 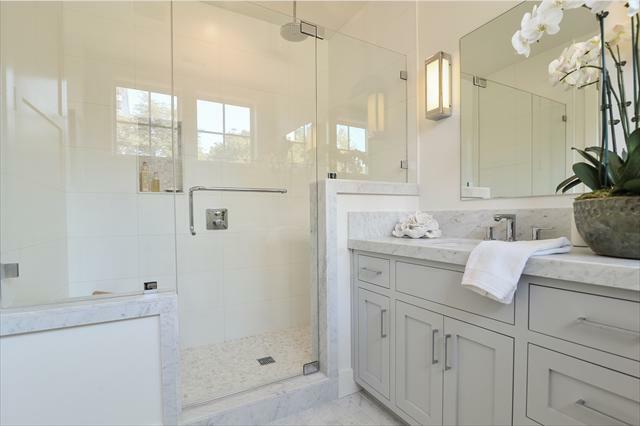 The en suite bathroom offers a Carrara marble dual-sink vanity, a glass-enclosed shower with marble bench and Hansgrohe Axis rainshower, and a Toto toilet. 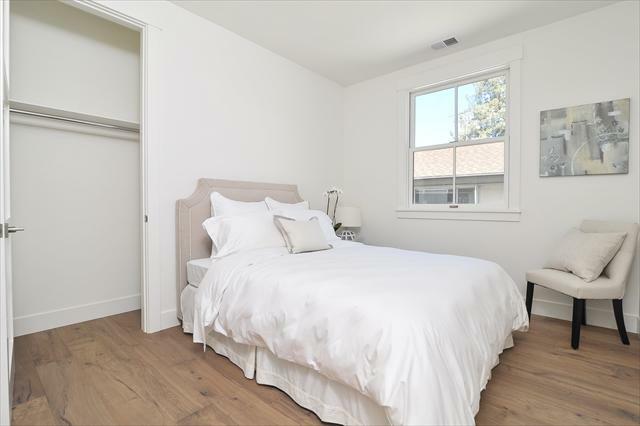 • Two additional bedrooms, one with a peaked ceiling and ceiling fan. • Custom barn door leading into pantry. 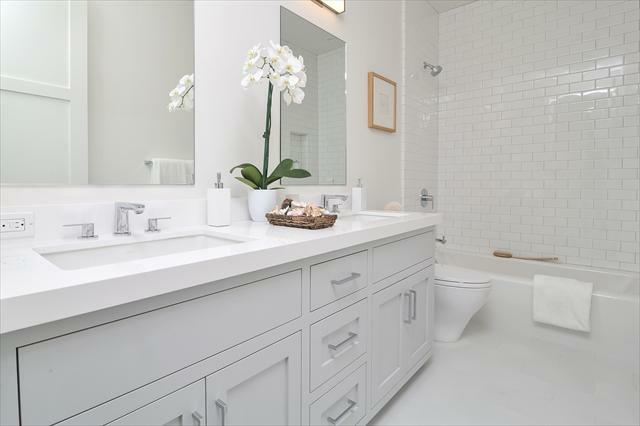 • Bathroom featuring a full tub with subway tile, dual-sink vanity, and Toto toilet. 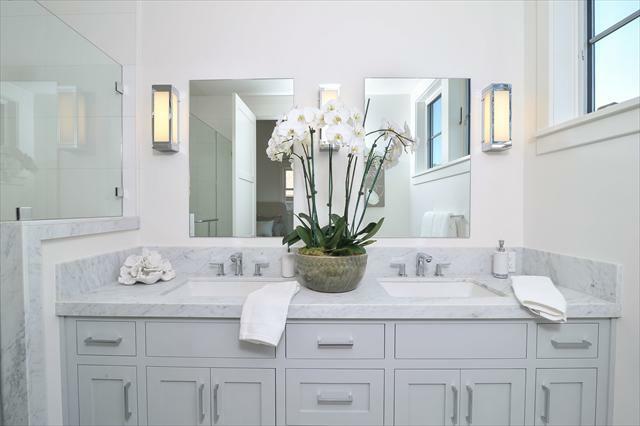 • Powder room featuring a custom vanity with Carrara marble countertop and backsplash, and a Toto toilet. 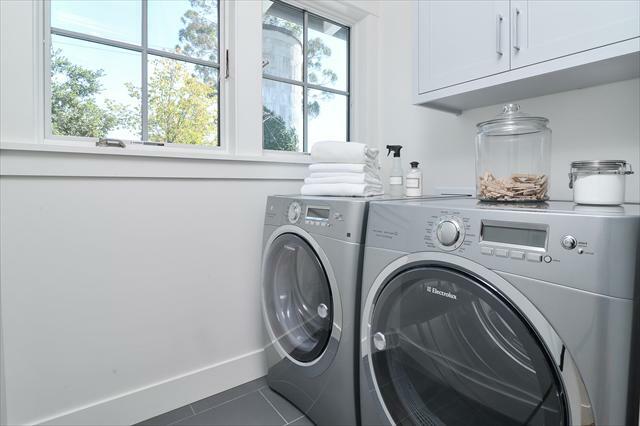 • Sun-drenched top-floor laundry room with Electrolux washer and dryer. 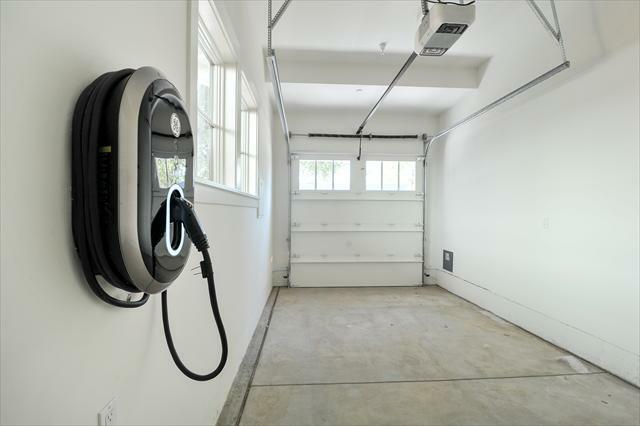 • Attached one-car garage with electric vehicle charging station. 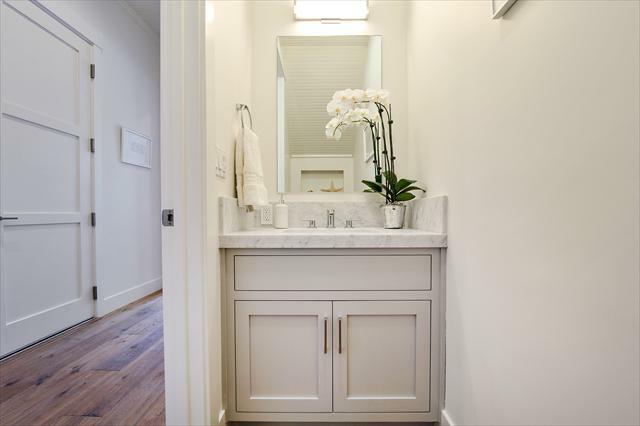 • Ample storage throughout hall linen and coat closets, plus a storage space under the staircase. 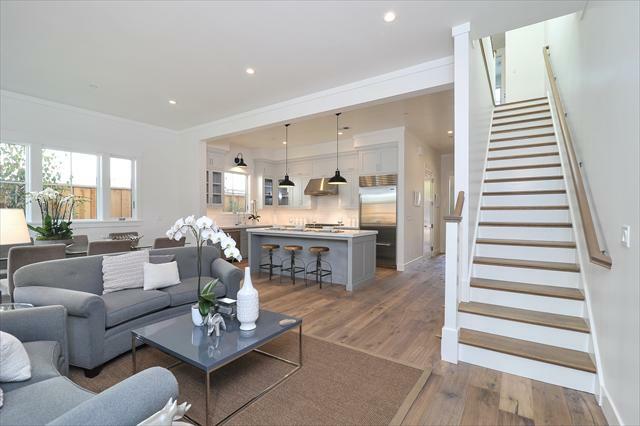 • Green and smart home features include Cat-6 wiring in each room, Nest thermostat, solar panel-ready, gray water diversion system, tankless water heater, and energy efficient windows and appliances.